Digital learning tools are seen by many people as those tools that are in some way different to other learning tools and need to be treated and discussed as such. “Let’s go to the digital learning zone” or “Now it’s time for class to use their iPads” are common announcements in many schools. Maybe we should stop saying digital, 21st Century and modern. I wonder if this mindset might be damaging to learning. In the developed world, Digital technologies are embedded in all life experiences and ’embedded’ is the key term here. Many schools set themselves apart from this life by making these latest learning tools somewhat mystical or special. Schools purchase class sets of iPads or Chromebooks and then allocate time slots for their use. Lengthy deliberations take place before Youtube or other social-media is permitted into school sites. Draconian blocking policies are written regarding the specific apps learners are or are not allowed to use in school (here’s an app kids use to get past the blocks). Punishments are organised for those learners found “off-task,” a judgement of “bad choice” applied to the student that is never applied to the teacher who designed the task being avoiding. Teachers do have a tendency to design tasks that they would enjoy or that work for their own way of thinking. On this matter, I would advise teachers check out Universal Design for Learning and the work of Katie Novak, Ed.D. The development of computer labs or “iPad hours” is something that whiteboards, pens, books and other learning tools never experienced. Many schools are still isolating digital experiences as something special and separate to the ‘norm’. This appears strange to the so called “digital natives.” They are “natives” not because they are naturally expert but because they have not experienced a world without regular contact with digital technologies, such as digital TV. What takes place in the digital lives of these ‘natives’ is routinely unspectacular and only commands the same level of interest as any non-digital thing they might do. This does not stop schools and institutions reacting to those more extreme stories that hit the headlines or become staffroom gossip when deigning policies and procedures. Individual teachers too use their personal fears or lack of confidence with devices and technologies, such as cloud computing, to restrict the opportunities of the learners in their charge. The format for learning that is most comfortable to the teacher can reduce the depth some students might reach and standardisation is still seen by many teachers as the only manageable way to assess the learners. How did “digital is separate” develop? The cost of these tools is also a complicated issue. I have heard many discussions about how buying an iPad is not like buying a pencil. There are many examples, such as this one, where schools prioritising the need to make access to digital tools as ubiquitous as pencils and paper, find ways to fund them, even when serving the poorest communities. Cost is often used as an excuse to bolster the preexisting reservations held by the adult school community rather than be an absolute obstacle itself. The primary / elementary sector are doing better at making a more life-reflecting adoption than secondary / high schools. It showed recently when it was reported at Ulearn, the biggest New Zealand education conference, that only 15% of delegates discussing current best practice were from the secondary sector. Why is this? I have much experience in training secondary school teachers to say that the power base they wish to retain as masters of their own subject silos, encourages them to shy away from any tool or pedagogy that might readdress the balance of control over the learning in the room. It doesn’t help that the universities are often as silo’d and traditional and demand more traditional preparation and evidence of learning. 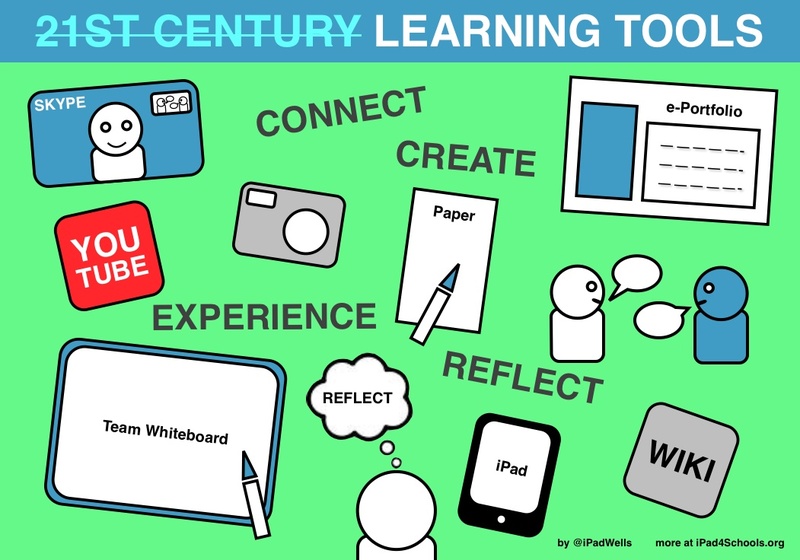 Although the pace to adopt digital devices is relatively rapid and there seems to be various understandings that they are either necessary or seemingly ‘ the ‘thing to do’, I wonder how schools will manage the mindsets of teachers and parents to not treat them as the only tool required or a special set of tools to release at particular hours of the day. If schools continue to treat these tools differently they risk operating a school environment that becomes alien to the students and thus harder to learn in. Young people have expectations regarding the ubiquitous nature of these tools and do not view them as special but just part of doing anything. A recent example of this was when my BYOD class showed far more excitement that they could write on the windows to plan their project than the fact that a video documentary was an option for the outcome. I can tell you one fact and that is that learning does not happen just because you’re holding a device or connected to the internet. In fact the reasons why successful deeper learning takes place have never changed, regardless of our rush to be excited about the web, social media and iPads. Young people don’t want to do everything on devices but do have experiences or witness examples daily of their effectiveness for communication, active learning and creativity output. Young people understand digital tools as a constant option on a Smörgåsbord of numerous tools to carry out all sorts of tasks both in life and for learning. All tools offer potential, the trick is to keep an open mind and not treat one tool differently based on one’s own skill set or experience. Big thank you to Beth Holland (@brholland) for giving me feedback and advice on this post before publishing. Checkout her work at edtechteacher.org.